I was recently asked to participate in a fun assignment for Lifestyle Mirror. 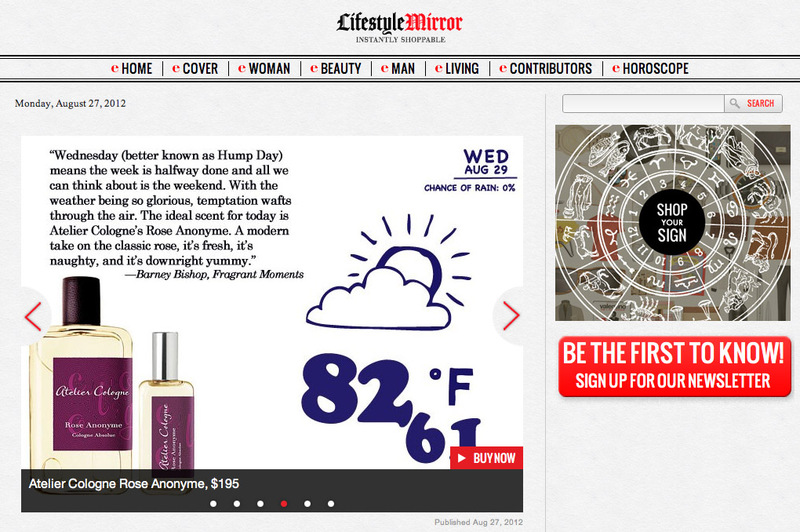 They wanted me to suggest a scent based on what the weather would be for a particular day. I thought to myself, “I love this one.” The twist though, the site caters to women. Could I pull it off? Whenever I walk into a store, I’m all about finding the men’s section and seeing what’s being offered to us. Nevertheless, what I ended up suggesting was a new scent by Atelier Cologne called Rose Anonyme. It is simply fantastic and the best part, it can be worn by either men or women. It’s going to be a scorcher in NYC today. Guess what, I’d still suggest Rose Anonyme as it works perfectly. But to get a look at what Patty White of Perfume Posse suggests for today or to see what the other participants suggested, Mindy Yang of Min New York, John Pegg of Kerosene Fragrances and Elena Vosnaki of Perfume Shrine head on over to LifeStyle Mirror. This entry was posted in Good Read, News and tagged Atelier Colgone, Elena Vosnaki, John Pegg, Kerosene Fragrances, Lifestyle Mirror, men's cologne, Men's Fragrances, MIN New York, Mindy Yang, Patty White, Perfume Posse, Perfume Shrine, Rose Anonyme, Women's Fragrances, Women's Perfume. Bookmark the permalink. I thought so too, Natalie. It was fun.